Freckled Citizen: Oreck Steam-It Review and Giveaway! Update: Contest now closed - winner will be announced tomorrow! 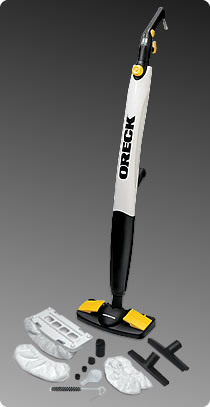 The huge prize up for grabs is... a steam mop from Oreck! The Oreck Steam-It comes with six different attachments to help you clean a variety of surfaces... including floors, windows, floor or shower tile, carpets, upholstery, windows, glass showers, drapery, countertops, marble, and more. The Steam-It retails for $179.99 and will be provided to the winner by Oreck. 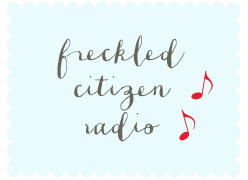 This review and giveaway is sponsored by The Freckled Citizen. Why do I need a steam mop, you're asking yourself? Well, I asked myself the same question when the nice folks at Oreck contacted me about giving one away to a reader. Here's what I discovered as I tested the Steam-It in my own home: by utilizing the simple power of steam, I can deep-clean our home without the use of chemical cleaners that give me, for lack of a better term, the heebie-jeebies. In addition, the pads the Steam-It uses can be thrown in the washing machine and reused - the ultimate sustainable solution. Need more pads? Sure, you can order them online... but the universal clips on this tool will also hold any old washrag or handtowel you already own in place, and you can use those instead. No chemicals! No disposable pads to not-decompose in a landfill! I like it. But how well does it work, you're asking yourself? I took the Steam-It on a spin in multiple areas of my house and took pictures for you. Visit Oreck.com and leave a comment that describes one thing you learned about the Steam-It. Sign up for Oreck’s email list by clicking on “Sign up for Email” in the top navigation bar and entering your email address. Tweet about this giveaway and mention @oreck and @freckledcitizen. This giveaway will be open for one week, closing next Wednesday, November 2. I'll announce the winner on Thursday, November 3. Good luck! Important Details and Rules: The giveaway winner must be a resident of the U.S. 48 contiguous states. You must be 18 years and older to enter. No duplicate comments. Winner will be determined via drawing on random.org. Odds of winning will be dependent upon total number of entries. Please leave a way for me to contact you if you win the Steam-It; otherwise, another winner will be chosen using random.org. This giveaway will run from October 26, 2011 until November 2, 2011. Disclosure – I was given the Oreck DualMax Air Purifier to review and keep. All opinions stated in this post are entirely my own. Oreck Corporation provided the prize for the sweepstakes but is not the sponsor of the sweepstakes. I watch them on QVC sometimes. I love these! We borrowed a different brand steam cleaner from my MIL when we moved into our house and I nearly cried when we gave it back. This one seems so much better though! I love that you can do spot cleaning with the Oreck! This looks awesome! I love my oreck vacuum. I love that you can wash the pads for sustainability! I felt wasteful before using the swiffer pads and stuff. But I am with you on the mop/dirty water/chemical stuff. BLECH! the spot brush work on your sink is much needed in my house. ack. also, our floors are always speckled with dog drool. i love that they call the (washable!) pads "bonnets". I like that you can use this on upholstery! I would LOVE to win this. I would love to clean our hardwood sans chemicals / the 3 step (re: tedious) Bona System! Bonus Points for the Barbara Ehrenreich mention. Nickel & Dimed appeared on 2 of my undergrad syllabi and I enjoyed reading it both times! It's definitely a Bookshelf-keeper! I like the fact that you can use tap water although they suggested distilled water; and, they send an attachment to use to clean mineral deposits should you discover that your water is "hard". I follow @oreck on Twitter. I liked Oreck on Facebook. That said, I never use my Shark Steam mop anymore. It didn't clean anything like the commercial said it would. I'll be happy to hear what you think of your Oreck in 3 months. I've been looking at one of these for a while now! I love that you can wash the pads, keeps cost down! :) We have an almost one year old, and I'm always concerned with what cleaners I'm mopping with for his saftey - this is so much better! I like Oreck on Facebook. Signed up for Oreck emails. And I can use it to freshen up my pillows? Be still, my heart. This item has been on my wish list! I love that it not only cleans floors, but also windows and grout. Who knew?! I signed up for Oreck emails! 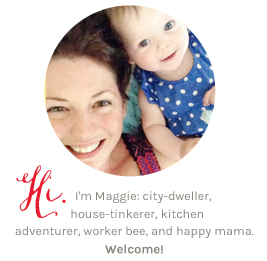 What a great giveaway, Maggie! What I learned over at Oreck, you can use the Steam-It mop on windows!!! I "liked" Oreck on Facebook. And I'm following them on Twitter. Thank you for the opportunity to enter! I "liked" Oreck on Facebook. I looove what steam does for old hardwoods. We borrow my mom's all the time but I would love to have one of my own. I also signed up for Oreck's email list. Wow, I'm impressed with everything that this device can do - even defrosting frozen pipes! Hopefully it would never come to that. I'd like to try it to spiff up our hardwood floors. Hi! I guess I learned this from your post as well, but I love that the Steam-It doesn't use chemicals. Also, I learned on the site that it heats up in less than a minute. awesome. Thanks for the great giveaway! totally unrelated...but i really love your entryway rug! I love how the Steam-It can clean curtains and freshen up mattresses and pillows. I've been wanting a steam mop forever, especially one that does more than just floors! I love that this one holds 40 oz of water too. I learned how it works so well on wooden floors. I love that you can go from your hardwood floors, to the bathroom, to your car upholstery! Would be great to have with my dogs! The option to use it on the bathroom glass is perfect! That is the one thing I HATE to clean because the chemical smell of being trapped in the shower when cleaning them is too much for me. You can use it on carpets and windows? Now that is too cool. Thanks for hosting the giveaway! i was pretty certain that you wouldn't be able to use tap water in it - glad to learn that you can! i have also "liked" oreck on facebook - thanks! I learned that it has reuseable, machine washable pads so I don't have to spend tons of money constantly buying pads! I didn't know that it could be used on so many surfaces! I had worried about my ceramic tile with stem cleaning, but am confident after visiting their site that I could use it on that and every surface in my house practically!! Like Oreck on Facebook Lisa W.
Awesome giveaway! I learned that it helps remove stains from furniture and car upholstery! With a Golden Retriever and muddy DC dog parks, my car upholstery could definitely use its help right about now! I love that you can clean grout and that the pads are reusable. I like that I can use it to clean my windows and shower stall with NO CHEMICALS!! I love that everything is chemical free. A must with two small children!! I was looking at their site and relized they also have air purifiers. We are starting to look for an air purifier for our living room and now I have another brand to consider! The squeegee attachment on the Steam-It would be just the best. So many windows with so little time in my house! I love that surfaces are dry within minutes. That's huge when you have a busy household! I learned the Steam-It heats up in less than a minute. I follow Oreck via Twitter. I learned that it Works upside-down without spillage for above the floor cleaning. This is spectacular. I learnt that its great for hard wood floors, which is awesome because my apartment only has hard wood floors which i struggle to keep clean! I would LOVE this and could really use it. Deep cleans without chemicals. Can sanitize by focusing steam on hard floor surface for at least 5 seconds. I learned that you can clean grout stains and soap scum from tile. oh boy I am loving the washable pads i have never even looked into these cleaners this would be great for my terazzo floors..
oh man! i have been wanting one of these for a longgg time now!!! i learned that it can be used on on most flooring surfaces including marble, ceramic, stone, vinyl, linoleum and sealed hardwood floors. def makes my day! thanks!!! i am following Oreck on twitter! fan of oreck on fb! signed up for orecks emails! I learned it works upside without leaking! That is amazing! I have never had anything like this! I signed up for Oreck's email list! I learned I can clean my floors without chemicals with the Oreck Steam It! thank you for hosting this awesome giveaway! i learned that the oreck steam it can even be used to freshen pillows and mattresses! how great is that? I learned you can use it to freshen pillows and mattresses! I follow Oreck on Twitter! I like Oreck on FB! I learned that the Steam It requires very little prep; It takes only a minute to heat up. I also love that it holds a whole 40 oz of water. I have all hardwood floors, so a tiny tank would mean changing the water often. I follow Oreck on twitter @Aerated. I signed up for the Oreck emails. I learned it only takes one minute to heat up. I learned that you can use it on upholstery. I like Oreck on fb. This mop could make cleaning fun again and my wood floors could use a good cleaning! I like the dry steam function, no locking the husband and dog out while I mop. I'm following Oreck on twitter! It has a 25-ft. cord, which is not always the case with a steam mop. Thanks! I learned that you can target tough upholstery stains and freshen pillows and mattresses. I follow Oreck on Twitter. I learned that it works upside-down so you can clean above the floor without spilling. I learned it works upside down without spilling! I learned that the 6-piece attachment kit that comes with the Steam-It contains an attachment that I NEED. I have been trying to get a nasty stain off of my stove top since I moved into this apartment - 6 years ago. I's become an obsession and I've tried everything buy steam. I love Love LOVE that you can clean any room from tip to bottom with just water! And they say even upholstry dries in minutes not hours or days!